Did you know that 90% of business owners fail when attempting to sell their companies? That statistic flies in the face of conventional wisdom that says the boomers business owners are going to transition their wealth by selling or transferring their companies in the next 15 years. All you have to do as their wealth manager is to wait till your clients pull the exit trigger, right? Only if you don’t care about growing assets under your management. Let’s face facts: If your client’s company is Un-Saleable, there is no way to transfer that wealth. It is a melting asset. And it is in your portfolio. What does this mean for you, the wealth manager, financial planner, investment advisor or private banker to these business owners? Your chances of managing that illiquid wealth locked up in businesses in your portfolio are 10%. If you don’t like these odds, you should know there is something you can do about it. You can break the bad news to your business owners clients that if they intend to claim their wealth one day from that business that they had better start down that road now. They can’t sell an un-saleable business the year they suddenly feel like it or have to sell because life throws them a curve ball. Our research with CapitalIQ and discussions with investment bankers shows a sorry state of affairs for business owners. 90% attempting a sale don’t attract a buyer or stumble on the way to closing the deal. How come your clients can have a successful business by all appearances (love that lifestyle!) and yet not find a buyer? Owners are unaware they must make their business attractive to the next owner. That’s why we have so few companies completing deals. Being successful is not enough. Buyers are picky about issues that sellers have no insight into until it is too late to do anything to fix the problems. Because owners don’t know what they don’t know (unless an influential person tells them otherwise! ), these are the mistakes they are making. Not setting an exit date 2-4 years from now. Not learning how to make a business saleable. Not building a plan to fix those issues buyers are picky about and then making these changes inside the business that make it worth what they want to sell it for. Not choosing a compelling next act for themselves that motivates them to let go of their business emotionally, long before the exit date. Still needing to play a functional role inside the business because it’s faster, cheaper, less frustrating to do it themselves, rather than mentoring new leaders. And yes, this is true for multi-million dollar companies as well as smaller businesses. The need for control is an achilles heal. 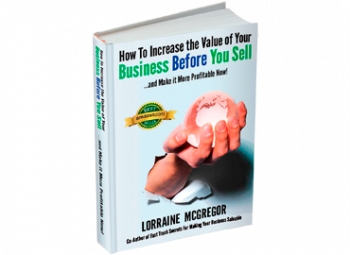 How to Increase the Value of Your Business BEFORE You Sell … and Make It More Profitable Now! 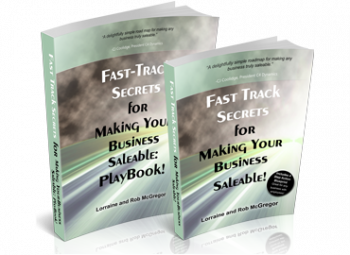 By reading “How to Increase the Value of Your Business BEFORE You Sell… And Make It More Profitable Now“, you learn what it means for a business owner to transform a company into a saleable asset and why the average lifestyle business is not saleable today. Decide what they want to sell it for. Commit that they will make the changes inside the business to make it worth what they want to sell it for by their exit date. Explore and select their next act so that they can emotionally let go of their role and business identity and look forward to a future they really want. Determine the kind of legacy they want to leave for their customers, employees, suppliers and partners so that their business continues to serve after they have moved on. So as their wealth advisor, how will having this potentially emotional conversation pay off for you? 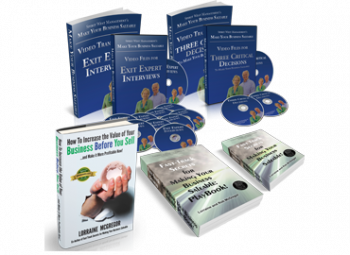 When you learn how to have this crucial eye-opening inspiring and motivational discussion, you will unleash wealth for both your client, their family and you. Skip the conversation and that future dims: Owners that don’t make their companies saleable eventually have to close due to their own lack of energy, interest, health, or uncontrollable variables like the business climate changing. We call an Un-Saleable Business a Lifestyle business: Lots of wealth on display (cars, trips, houses) but no real wealth that is investable. They can invest their salary and dividends but not claim their illiquid wealth from the business. You may need to help your business owner clients build a Plan B for their retirement if your calculations included the sale of their business. Owners who make their businesses saleable own a winning lottery ticket: we call this a wealth generating business. They are attractive to buyers willing to pay a premium. Depending on the size of the business they become millionaires overnight the day after they close the deal. They now have a sizeable sum to take care of their family and future and live the lifestyle you’ve become accustomed to. And you as their trusted advisor who has seen them through this journey from unsaleable to saleable is now entrusted to manage this wealth. What Kind of Businesses Lurk in Your Client Portfolio? We teach advisors how to have this challenging conversation with their clients so that they feel confident in serving as the bearer of this news. Help them become aware they must make this big life changing decision because they don’t know there are two choices. Then show them how to activate the choice they do want. Your job is to explain their options. Then get them the right resources to make an informed decision about which exit path will take them to their desired end result: to close one day, or sell one day. We show you how to make sure they start the journey to either the Lifestyle or Wealth Generating destination. We are not suggesting you have to advise about how to make a business saleable. When you’ve asked your clients which direction they will take and helped them find the best answer for their situation, then you will know what kind of performance to expect from the assets in your portfolio. You can find out what aspects of a business make it unsaleable and what to change by taking our “Is Your Business Saleable” quiz. If differentiating your wealth management practice is important to your future, then learn about the difference between a Saleable and Un-Saleable business by reading any of our books. Want to talk about how to position your wealth management firm to be a business owner’s best ally? Send me a linked in message or call us at 604-306-7707. Our wish for all business owners is to own a saleable business. It’s more profitable and easier to run. Our wish for wealth managers is that you sleep better at night knowing that your client portfolio is going to keep growing as you help your clients get on the saleability path.